Energy storage is going to be an important part of the UK’s energy generation and distribution system, helping to smooth out the intermittency of renewable generation systems and ensuring smooth supply on the grid. Stuart Nathan looks at some of the technologies available and in development, and finds out that provision of storage may be rather complicated. The electricity sector is currently undergoing its biggest transformation for over half a century. The need to diversify electricity generation sources, bringing in new renewables, nuclear and fossil fuel plants to work with the existing generation infrastructure, the adjustments to the distribution network to allow these sources to contribute to the National Grid, and the development of smart grids and intelligent appliances to allow demand to be varied according to the availability and cost of power throughout the day, are all changing the way that electricity is generated, accessed and used. However, there is another component to the electricity network which also needs attention, but which, at the moment, is not gaining a foothold: energy storage. This is going to be vital in the coming decades: according to a Technology Innovation Needs Assessment (TINA) from the Low Carbon Innovation Group published in August, the UK’s energy requirements in 2050 will include 7-59GW of total grid-connected electricity storage capacity. There are two main reasons for this, according to an accompanying report from Imperial College’s Energy Futures Lab. The first is the increasing capacity of renewables in the energy landscape. As opponents of windfarms are quick to point out, the wind doesn’t blow all the time, so it’s important to be able to store excess electricity generated when it’s windy to even out the supply. The same applies to wave power, if it is developed as a large-scale technology and also, for slightly different reasons, to tidal power. Although the tides are highly predictable, they don’t necessarily occur when electricity is needed; the power generated by night-time tides, for example, would need to be stored. The other reason is an upcoming increase in demand for electricity, the Imperial report says. As heating and transport systems are electrified in the coming decades, peak demand will rise sharply, and this ‘may lead to a significant degradation of generation infrastructure and electricity network assets’, leading to an increase in the cost of system integration; energy storage has the potential to reduce these costs. There are several technologies, in various stages of development, that could be used for energy storage. 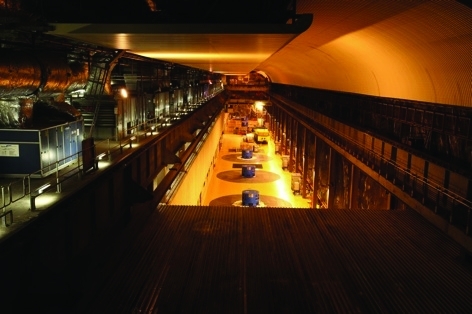 In the UK, the largest grid-connected storage schemes at the moment use pumped storage, a variant on hydro-electric power: excess electricity is used to pump water from a low-level reservoir to a higher-level one, and when the electricity is needed back on the grid, the water is allowed to fall under gravity through a hydroelectric turbine. The largest of these facilities is considered to be one of the UK’s current engineering marvels: Dinorwig, in the Welsh mountains of Snowdonia, also known as ‘Electric Mountain’. Consisting of 16km of tunnels inside the Elidir Fawr mountain, it took ten years to build and cost £425million in the 1970s, with 12million tonnes of rock excavated to create what was then the largest man-made cavern in Europe. The station has six 300MW generators, giving it a total capacity of 1.6GW. And therein lies the problem: it’s only a small fraction of the storage the UK is projected to need, and there is little opportunity for further pumped storage of a similar size: it requires mountainous landscape, which is limited to a few parts of the country, and those are areas of natural beauty, rightly protected and very complex to build in. 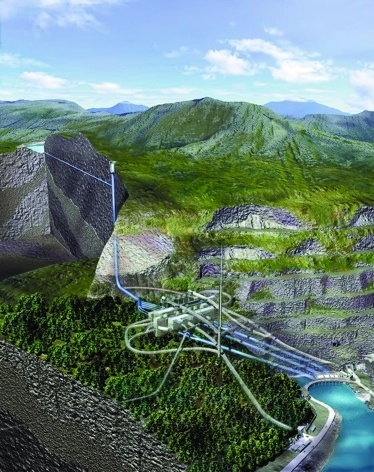 While there are smaller pumped storage facilities in Scotland and there have been plans to convert hydroelectric stations to pumped storage (and even a proposal to build a similar sized facility to Dinorwig in Exmoor, which was abandoned in the 1970s when plans for large numbers of nuclear power stations were shelved), it’s unlikely that pumped storage could meet UK grid-connected storage needs. But the situation, even with intermittent wind-farms, isn’t as simple as it seems. It’s wrong to assume that every wind farm would need an associated energy storage system, insisted Steve Argent, senior consultant for major power projects at Arup. ‘It’s a grid issue,’ he explained. ‘The fact is that the UK is a very windy country, and although it’s quite true that one particular place might not have wind at any one time, leaving its wind turbines idle, it is very likely that another place will have plenty of wind.’ The storage issue isn’t so much backing up individual wind farms, he said: it’s making sure that the whole system has enough back-up to cope with averaged-out variations in wind that the country as a whole experiences. In fact, Argent said, the storage issue could neatly be turned on its head and looked at as an argument about demand, rather than supply. If demand could be matched to supply, for example through smart grids and intelligent appliances and industrial equipment which can alter their electricity usage according to how much is available, there would be no need for additional storage. ‘We’re talking about fridges that cool themselves down more when electricity is plentiful, then switch themselves off during peak time,’ he added. However, as with most trade-offs, the actual situation will lie somewhere between. The establishment of smart grids and updating of applicances and equipment will balance out demand to a certain extent, but the grid will still need storage available. One problem might be that there is no organisation which can negotiate between different companies: if there’s a need to link four windfarms which are owned by different operators, who pays for the storage and who builds it? And then, Grünewald added, there’s the issue of what the contracts might look like, and how to handle competing interest. This is currently being investigated by Scottish and Southern Energy, he said, which is trying to set up a storage scheme in Orkney. SSE is providing an 11kW network access point, and inviting potential storage providers to build capacity alongside Kirkwall Power Station; the question of the commercial contracts, and how they can be set up to provide an incentive for the storage providers, could prove a sticking-point to whether anyone comes forward with a proposal. The storage system looks like a classic market problem: storage systems will allow operators of intermittent generation capacity to utilise their equipment fully, and therefore maximise their potential earnings. But without some kind of overarching oversight, it seems that the problems might outweigh the solutions. The situation is developing, but as with everything associated with the UK’s energy network, the clock is ticking and the time to 2050, which once seemed so far away, is now uncomfortably close. Electricity can also be stored chemically, of course, and battery systems are an obvious choice for energy storage systems. However, the problem of how to cram as much energy as possible into a small space while minimising the use of hazardous substances is just as pressing to those involved with grid-connected energy storage as it is to those developing batteries for electric vehicles. One type of battery under consideration for grid-connected storage is the redox flow battery. These release energy through a reduction-oxidation reaction between two liquid electrolytes, which are held in separate tanks and pumped into a reaction chamber where they are separated by an ion-exchange membrane. This removes the link between the power density and the energy density of the system; the power density is determined by the size of the storage tanks, and the energy density by the size of the reactor. These systems can switch between charge and discharge quite quickly, which makes them a flexible way to respond to rapid changes in demand and supply — handy for wind turbines, for example, where the speed of the wind is unpredictable. However, their dependence on pumps and the inherent losses where chemical reactions are involved reduces their efficiency. The systems are currently at an early demonstration phase, with some 20 companies attempting to produce systems that can store energy cheaper than $500/kWhr. Another type of battery is the metal-air cell, where oxygen acts as one of the electro-active materials in the battery. Since oxygen does not have to be stored, the structure of the battery is simpler than an a two-electrolyte cell and has a higher energy density. Known since the mid-19th century, metal-air batteries consist of a porous carbon electrode, which holds the air that forms the cell’s cathode, separated from a metal anode by an electrolyte. They are now the subject of research because they have the potential for the highest specific energy of any battery technology. Most current research centres around zinc-air and lithium-air systems. Lithium-air systems have a very high energy density, but the lithium needs to be protected from water, making them more complex and expensive to build. Zinc-air systems are cheaper and safer for the environment, but hold less energy. Metal-air batteries are currently in lab-based R&D, with efforts to improve their capacity and their resilience: current technologies lose their capacity after around 50 charge-discharge cycles. Using excess energy to generate a fuel is receiving increasing amounts of attention. Teesside firm Air Fuel Synthesis earned headlines last month with a process that combines CO2 in the air with hydrogen generated by electrolysis to produce a hydrocarbon; in the US, a spin-off from Princetown University, called Liquid Light, is attempting to commercialise a technique developed in the 90s to generate methanol from atmospheric carbon dioxide; while in Iceland, Carbon Recycling International’s CO2-to-methane plant has been operating for almost a year. These technologies have been touted as a method for reducing the CO2 in the atmosphere as an alternative to carbon capture and storage; however, as burning the fuel they produce re-releases the CO2 to the atmosphere they are perhaps better seen as a method of energy storage. 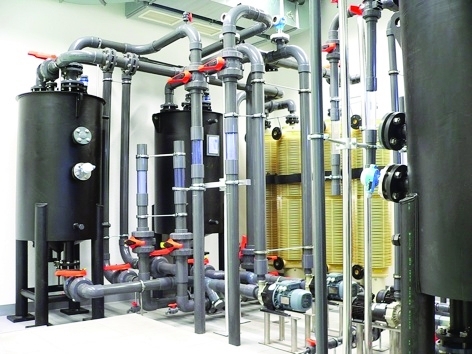 Sheffield-based ITM Power makes this link explicit, promoting its system of hydrolyser stacks which generate hydrogen from water as a method of storing megawatt-levels of electricity. The company, which is involved with the EcoIsland project on the Isle of Wight claims to have produced systems which can compress, store and dispense hydrogen at 350bar, which can be used as a vehicle fuel or a energy-storage medium for electricity generation via combustion or in a fuel cell. The company is running a project called GridGas which envisages using excess electricity from wind farms to split water, storing the hydrogen generated by electrolysis and selling it onto the gas network when demand rises. 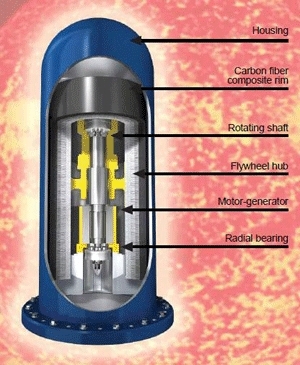 Two other techniques, compressed air storage and cryogenic air technology, work in a similar way, but rather than using the excess electricity to generate a fuel, they use it to compress or cool air. In compressed air storage, currently under consideration for wide-scale implementation in the US, the air could be stored within depleted gas wells and underground caverns; cryogenic technology stores liquefied air in refrigerated vessels. In both cases, the energy is released by allowing the pressurised or liquefied air to return to atmospheric conditions and release its stored power through a turbine to regenerate the stored electricity. Used for centuries to store kinetic energy, flywheels are now being considered for large-capacity energy storage owing to developments in materials science and bearings technology. The basic principle is simple — a heavy rotor is connected to an electric motor, which accelerates its spin when energy is available for storage; conversely, slowing the wheel down releases energy. Companies such as Beacon Power in the US, and Flybrid and and Williams Hybrid Power in the UK, have developed carbon fibre-composite wheels inside vacuum chambers, supported by low-friction bearings (using magnetic levitation, in Beacon’s case), to develop systems which can store large amounts of energy and release it quickly without losing energy to friction. Current flywheels designed for grid-connected storage are rated at 250kW for 10-15min, or 500kW for 36 seconds. The largest installed capacity so far is a 20MW facility in New York State, which is designed to regulate the frequency of the AC electricity supply. Frequency drops when demand exceeds supply and vice-versa, which can lead to blackouts, so the plant acts as a ‘throttle’ to balance supply and demand and keep the frequency constant. The plant , which was installed last year by UK contractor Mott McDonald, uses 200 1.3tonne flywheels. However, earlier this year Beacon declared bunkruptcy and was forced to sell the plant back to the US Department of Energy, which had lent it $43million to develop the technology. Flybrid and Williams both developed their designs as components for KERS in Formula 1, and both are being used by automotive companies to store power in hybrid cars. However, interest for larger systems, for example for buses, trains and trams, and for static systems is high: the companies are developing static flywheels to be connected to generators to store energy for developing-world communities, for example. It would be only a short jump and a scale-up to transform this into a system for grid-connected energy storage. PIEZOTRANSFORMERS AND PYROGENERATORS..COULD SAVE US FROM THE DARK AGES..
For sure tidal turbine lockbrigdes could be constructed and installed in harbour mouths such as Poole Christchurch and Chichester… and maybe they would pay for themselves..
All power generation systems could be upgraded with new coil alloys and more powerful magnets such as samarium cobalt..10,000 times more potent?!.. appropriate field effects could be developed and designed..
but why not do away with the supply side into transformers get rid of powerstations… and generate the varying magnetic flux using samarium cobalt magflux piezo crystals with 0.1% deformation actuators..to drive magflux through secondary coils in substations..
or use pharonic technologies that were developed to melt the ores for the treasures of the pharohs in ancient egypt.. the pi-ro-generators..
for sure a spiral tube with appropriate alloys coiled around it could generate self driving emfs with trains of samcob appropriately designed magnets running through it.. and back up inside or around it… maybe local transformers do that anyway in some extravagant con!!! for sure the £10billion spent on finding a particle with hadron collision could better have been spent on generator developments!!! We can only see the true value of electricity storage when we look at the optimisation of the whole system. Electricity storage is a system benefit and has to be considered as such. Now is the right time to make sure that our energy policies include the role of storage and do not restrict the opportunity to use storage in the future. We must avoid decisions now that we will regret later. Distortions in today’s electricity market divert investment away from electricity storage projects and market reform needs to correct this. 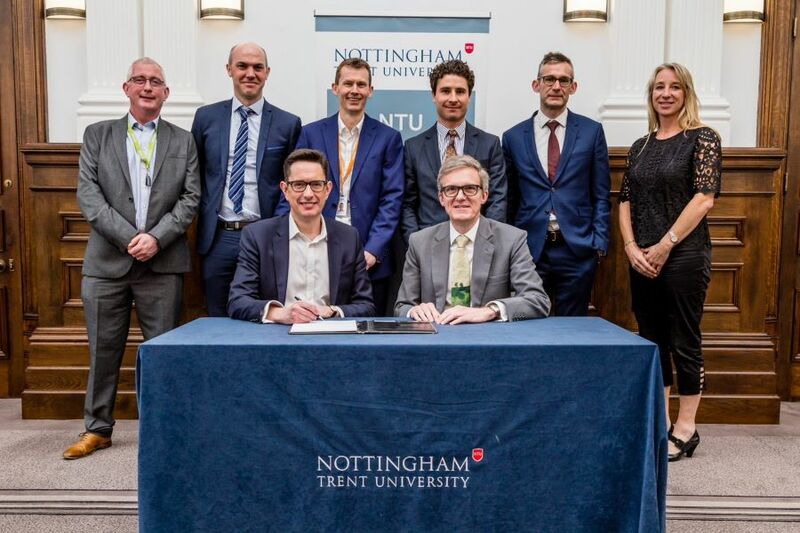 If the UK can deploy its new storage technologies, and grow its technology companies, then the successful home base will provide a showcase for overseas sales. All the storage technologies discussed above are for short-term energy storage. What solar and wind power must have is energy storage for days or weeks and even months. The storage must be low cost and must be efficient. No such technology exists and none is on the horizon. So there is no prospect for large-scale adoption of wind and solar power – which, in any event, only exists because of massive subsidies. The whole thing is a nonsense. I have to argue with Mr. Leyland’s comment. The difference between atmospheric CO2 and pourable, wet fuels is energy. Here is the energy and there is the store. Fundamentally grid scale energy storage is a system tool and should be paid for in a similar fashion to other ancillary services, indeed Dinorwig derives much of its annual income in this way supplemented by earnings from arbitrage. The second natural market for storage is at a smaller local scale at the heart of micro grids and it is here that technologies such as flow batteries come into their own with the Vanadium Redox battery being closest to full scale market deployment. Produced in quantity VRB is closest to the target price of $500/kw. Effective storage removes the need for subsidy for renewables. The longer that the politicians and regulators dither on the storage issue the greater the eventual cost to the consumer. The coments on storage point-up the need for managed demand, as is already done for (at least some) domestic supplies in France. 6New business model and new field . No Bryan, your comment is a nonsense. As Steve Argent points out, the energy storage issue is – “making sure that the whole system has enough back-up to cope with averaged-out variations” and the variations in both supply and demand are typically less than seven hours duration. “energy storage for weeks” is a silly proposition. But, the technology does exist (since the 19th century) to store wind/wave ENERGY long-term and it is certainly efficient when it’s placed BEFORE generator. This is especially true of marine renewables, because it forms part of the vessel’s structure and the energy is free!! Design your offshore renewables this way and they are no longer ‘intermittent’ – they become ‘firm’, dispatchable and secure (distributed). The subsidy ‘thing’ is a red herring. As Pat asserts, the right storage would more than pay for itself. The problem is correctly identified in the article. The barrier to building ANY (innovative) storage solution is the dysfunctional structure of the market and the industry – they’re not fit for purpose and neither is the Energy Bill! I’m sure this can be done for less than the ‘strike price’ of new nuclear, and nuclear is a problem because of its inflexibility. That makes it unsuitable (on a large scale) for future electricity grids and consequently diminishes its profitability. It’s staggering to realise the time, effort and expense that must have gone into, and will continue to go into, these unnecessary technologies. All that is needed to meet the UK’s future electrical energy needs is a fleet of load-following Integral Fast Reactors (IFRs). These are designed and can be built in 36 months. There are 30 years of electricity generating experience behind the technology. A Government spokesperson has already said there is no real impediment to early licensing of the design. These reactors come in the form of a GE Hitachi PRISM Power Block, comprising 2 x 311 MW reactors and an integral fuel reprocessing plant. The first one is on the cards for burning up our 55 tonnes of plutonium, whilst producing 622 MW of commercial electricity, for a 5 year period – and no greenhouse gases. That’s the proliferation problem sorted. A fleet of them could produce all of the electrical energy required in the UK, for 500 years, fueled from existing legacy waste. That’s the ‘problem’ waste of SNF (spent nuclear fuel) contained in ponds and dry cask storage, all around the country. The waste-stream from burning this resource is minuscule in volume and decays to background radiation levels in 300 years – easy, cheap and safe to store. That’s the mega-thousand years repository problem sorted. These reactors are orders of magnitude safer than the PWRs/BWRs budgeted for our 16 GW of ‘New Nuclear’. That means they shut down, under the worst of accident conditions, according to the laws of physics and without human intervention. That’s the safety ‘problem’ sorted. Will the anti-nuke brigade be able to find any other problem source for their virulence? Probably – but let’s hope their effectiveness is about to fizzle out. “PRISMs to Power the UK” gives us hope for a resurgent UK manufacturing industry. If we are going to have Nuclear power, a preliminary review of the Colin Megson proposal for “PRISM” technology is worthy of further consideration. The best Pump Storage system we could have is the Severn Barrage. The problem of high & low water preventing generation is solved by an intermediate lagoon or by the use of a second barrage because High & Low tides occur at different times around UK. The River Rance barrage in France produces electricity cheaper than the French Nuclear station and it has paid for the barrage. Because of a high River flow, it is primarily used on outflow whereas the Severn Barrage is bi-directional contrary to comments by people in Westminster. This can hold water for the 7 hours suggested, releasing power generated at night for the morning peak instead of inefficient cycling of thermal stations. The available generation capacity depends on where you build the barrage in the Estuary. How many power stations do you want to replace? A barrage design life is 140 years from memory, a Nuclear Unit is normally 25 years; longer in both cases if you have good maintenance Engineers. The CEGB recognised the problems of storage back in the 1960’s and built Dinorwig which was the only site which met the technical and economic criteria for a viable scheme. The best Scottish site had already been built and commissioned. As far as the Severn Barrage was concerned studies showed that it was possible to build a system that generated continuously (using water storage and multiple dams) and that a continuous output of around 3 GW was feasible. The scheme would also provide extra deep water docks and a road and rail bridge from Wales to Somerset/Devon as well as water sport facilities. For the same cost it would be possible to build a bridge, a rail tunnel, docks sport facilities and 3GW of nuclear power stations. The need for continuous dredging of the Bristol Channel would not be necessary thus saving of maintenance costs that come with a hydro scheme. Lets get on with a nuclear build programme ASAP to ensure that the lights don’t go out and we limit CO2 emissions! FISH and wind are same in sea .Both are dynamic .the fisherman goes to sea , change his place and casts the net where fish is .if his boat is anchored it in one place through the year he do not get any fish .so he is dynamic and cast his net where fish is . Same like wind and wind turbine. Wind blows where it likes .today’s turbines are inadequate to capture wind even if the wind blows 100meters away from the off shore turbine because it is stand still and fixed in sea. My idea is a dynamic wind capturing technology where the turbine is dynamic ei it follows the wind where it blows . We are using wind energy to sail large ships from BC through the oceans throughout the world .Large masts of height about 100m are there in the ships to capture the wind and used to move the ships with greater speed .the ocean races such as Volvo ocean race is famous for using the wind power for the race .I am utilizing this idea to design a dynamic wind turbine ei capturing the wind power of a greater area using sailing mat and concentrate it through a cone shaped funnel .the air coming out of this funnel is hitting on a turbine with higher velocity .the cone shaped funnel is a wind accelerator and the air coming out of it is having a higher velocity .the turbine is connected to a generator .the electrical energy is stored in vanadium based batteries in the base of the ship with 75% efficiency . I got this idea when I heard a news that a big 16 wheel truck over turned when it passing through a bridge where both shores of the river banks having big buildings .this happened because the wind blows with higher velocity through the restricted area of the river .the same happened I Kerala ,India on 20 years back when a train was overhauled in Punnamada lake while it was crossing the bridge . the oil tanker can be used to store wind energy as a storage of energy when wind blows at night or no demand and use this at peak time .the oil tanker is already in sea so no need of installation cost.
. The ship is anchored in sea using anchor according to the data from met office where highest possibility of wind in the sea occurs .the cone shaped collecting mat is facing the wind and is the this wind is going through the funnel where the velocity of the wind increases as the volume of funnel decreases .this high velocity wind is hitting the turbine blades same as Water from pipe hitting a turbine .due to the high velocity ,the turbine runs faster .the turbine is connected to a generator and this generator is connected to vanadium filled batteries for storing electricity produced .when this battery becomes fully charged the ship or vessel is going to the shore to discharge the power to a substation so that the expensive cables ,substations ,expensive laying of cables in sea ,offshore maintenance cost etc can be avoided. It may make sense to put the storage next to the wind farm because this can reduce the cost of electricity transmission. So for example, a 15GW Dogger Bank wind farm could have super tankers converted into flow batteries in the middle of it, so it doesn’t need a 15GW HVDC link. On a smaller scale, houses with PV systems and a small battery would only need a 13Amp connection to the electricity mains. Things look brighter if we only want 1 day or so of storage, rather than the oft mentioned 10 days or more. That would still allow us 60-80% renewables, with support from flexible gas CHP generation. At local level, our 5.6KW solar installation would need a 15KWhr store to require no imports for 8 months of the year. In winter, when we need heat, gas fuel cells would provide electricity. We only need long term storage if we want to get close to 100% renewables. The amount of storage needed rises significantly as we approach 100%, but statistically, no amount storage will enable 100% renewables. However, to get between 60 and 80% is much easier. I haven’t come across a statistical model but I estimate 3KWhrs of storage per KW of generating capacity would enable over 60%. Second, it is not nonsense to consider multiweek storage schemes. Aggregated wind output from entire regions…such as North America or all of Europe, varies on about a three-week cycle. In current thinking, the remainder that cannot be balanced by pumped storage will have to be made up by dispatchable generators. There are a few potential pumped storage sites around the world that can store energy over multiweek periods, such as the Lake Erie-Lake Ontario system in the US, which can store 1300 GW-hours of energy if one allows the lake level of the smaller lake (Lake Ontario) to shift only 30 cm/cycle. I presented a paper on this to the Energy Storage Association in May 2009; there is no chance of implementation any time soon, but also no doubt it will work. There are also no comparable lakes in Great Britain. Japan has built a sea water-based pumped storage system with an elevated upper reservoir, which I also did not see mentioned in the article. The advantage of such a system is that one needs only one reservoir, though the need for corrosion resistance increases equipment cost. I particularly like the “stone-age” idea of storing energy in concrete balls raised to the top of a cliff in a bin, then released back to conveyor system to run the motor as generator. What a brilliant idea! Thanks, Brits! Here in Texas we have an escarpment that runs for hundreds of miles right near my city, and another southwest of Dallas. What an opportunity! PV has been installed on over 800,000 houses in the UK. At a guess I would say over 50% of these installs have electricity that is being exported back to the grid during daylight hours, when it is not needed. Installing Battery Storage Units onto these PV Systems will reduce the demand needed from the grid at the peak times, evening and when the solar panels are not generating.